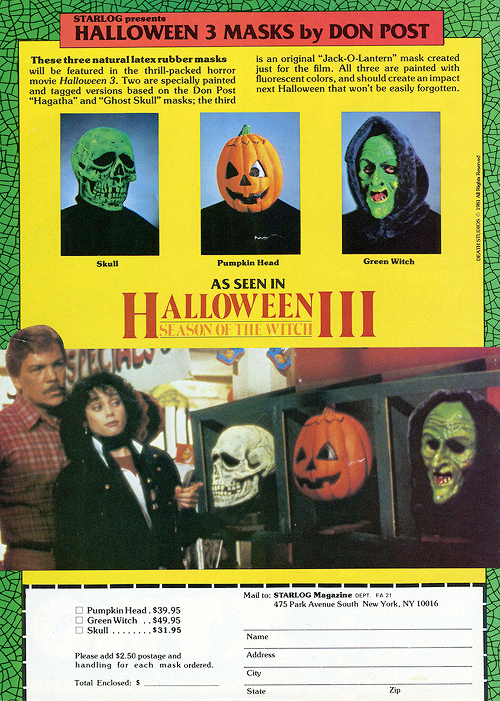 What’s Your Favorite Mask From ‘Halloween III: Season Of The Witch’? During these election times where we have to decide between a dumbass and a liar (up to you to decide who is who) for the presidency, my right to vote is now more important than ever. Sarcasm overflowing there, I think we can use that right to vote on something more meaningful……..like what is your favorite mask from Halloween III: Season Of The Witch?! For me, I give my vote to the skull. I’ve always had a bit of thing for skeletons, so no surprise with my choice. Not much of a witch guy and the pumpkin is too cute (except when snakes and bugs are coming out of it’s head), so for me it’s the skull all day every day. The great news is that you can grab a replication of these masks over at Trick Or Treat Studios. Btw, I stumbled upon a a great ad from an old Starlog magazine for the original Don Post version masks that you could purchase, with the skull being the cheapest which is maybe another reason why I like it the most. Take a look below and feel free to share what YOUR favorite mask is!